I was seriously taken aback today when I saw this on the road. 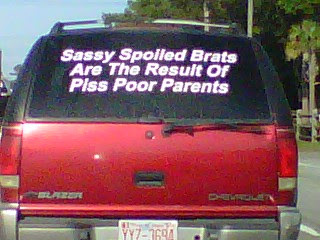 This driver either had a truly terrible experience with a bratty kid, or was just that upset with the season finale of Toddlers and Tiaras. Either way, the message is coming through loud and clear! ...NOT a fan of bratty kids!